Over the years I have had friends ask me, “Whats a good time to open an expensive bottle of wine? Only at a special occasion?” My reply to them “Any day is a special day. If you wake up, it is a special day”. Now granted most people do not open a $100+ bottle of wine frequently. I wish I could but I did not win the lottery. So the point is do not hold the expensive bottles of wine for a special event. You never know what life will lead you and who’s to say the wine becomes to old and is no good. So today was one of those days. Life is relatively good. I have a great wife and we live a good life. So why not share a great bottle of wine with the one you love? 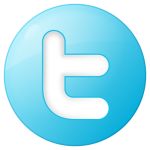 I did and have to say it was excellent. Beringer wines are good. They are on the pricey side but, they age well. We have been members of the wine club since 2007. Aromatic, starting to show some age. Earthy notes, spice, sweet dark fruit, plum and raisin. Dry, full-bodied, great acidity. There were tannins still. Rich mid-palate flavors with a long mouth-watering flavorful finish. We did not save this wine for the next day. Chris and I enjoyed it through out the night. The wine continued to develop as we drank it and it just keep getting better. 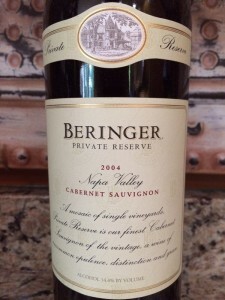 I rated the 2004 Beringer Private Reserve four glasses. 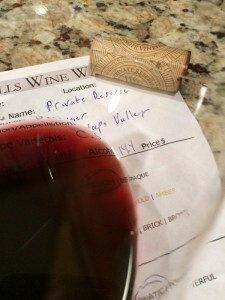 Do not be afraid to pull the cork on one of your “Special” wines.